One of the boldest moves in the Indian economy took place on 8th November, 2016 when the government declared that the existing notes of Rs. 500 and Rs. 1000 to be invalid from 8th November midnight. 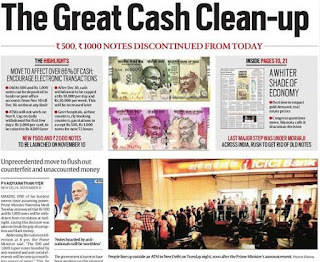 The high value notes were ceased to be legal tender and this act of striping the currency from its status of legal tender is known as Demonetisation. This was an important step by the government to curb black money and counterfeit notes in the economy. GDP Indian economy is largely cash driven. This is why the economy slowed down due to the less- availability of cash in cash-incentive sectors such as real estate and manufacturing. The businesses were not able to meet the cash requirements due to the restriction imposed by the government. Micro, Small and Medium Enterprises (MSMEs) This sector is one of the major contributors to the Indian economy and employees a large number of daily wage workers. These workers were mostly paid cash which led to unemployment and loss of jobs. Agriculture This sector of Indian economy relies heavily on cash. Farmers were facing a lot of problem in selling their produce at mandis. Healthcare The hospitals were not ready to accept the money in old denomination which had serious repercussions for the patients. Education A lot of black money was recovered from private institutes that was received as donation from the students. 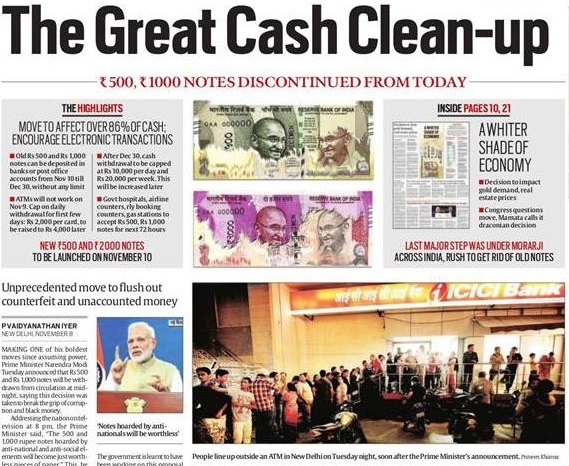 No Cash for Daily Transactions People in the market were not ready to accept 2000 rupee note as shopkeepers, grocers and vendors have no cash available with them to give in return. Quarrels People had to stand in long queues for hours and hours making them lose their patience easily ultimately leading to fights and quarrels on petty issues. Curbing Black Money This step was helpful in curbing and nabbing black money to an extent. The hoarders had to forcefully and unwillingly cl6clare their wealth. Surplus cash in banking and para-banking system There was a large inflow of cash into the banking system. People started investing in mutual funds and insurance companies. Detection Shell Companies The government has been able to detect a large number of shell companies operating in the economy. It has already started the process of deregistering them. Financial Literacy and Inclusion In a way, this step promoted financial literacy and inclusion. Bank officials actively participated in teaching the people about different schemes and deposits available with the banks. Digital and Cashless Economy A large chunk of people actively started using mobile wallets, electronic transaction systems etc. Tax Compliance It lead to better tax compliance owing to better targeting of income. The digital push of the government resulted in higher indirect tax revenue for the government in the form of service tax. Curbing Terrorism This was one of the major step in curbing the stone pelting in Jammu and Kashmir and combat terrorism.